Viewed from the Banana River Viewing Site at NASA's Kennedy Space Center in Florida, space shuttle Discovery arcs through a cloud-brushed sky, lighted by the trail of fire after launch on the STS-128 mission. Liftoff from Launch Pad 39A was on time at 11:59 p.m. EDT on Aug. 28, 2009. Thebrilliant midnight launch of NASA?s space shuttle Discovery late Friday broughta false dawn above Florida that was captured in spectacular images by photographers on Earth. 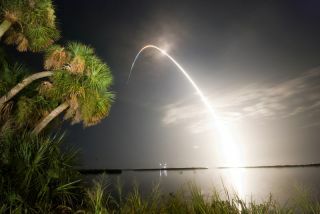 NASAphotographer Jim Grossman caught a snapshot of Discovery rising like a smallstar over its Kennedy Space Center launch site, while another - photographer BenCooper - took a stunning time-lapse photo of the liftoff as it painted a blazingarc across the night sky. Discovery soaredinto space under a black sky at 11:59 p.m. EDT (0359 Aug. 29 GMT) as one ofonly seven shuttle flights currently remaining before NASA retires its orbiterfleet in 2010 or 2011. As of now, it is also NASA?s last scheduled mission to lift off in totaldarkness, though that could change as the launch manifest is finalized, shuttleofficials have said. But regardlessof how many are left, Discovery?s launch was definitely one to remember,mission managers said.
? [It was] areally clean launch countdown, a beautiful and spectacular launch,? said PeteNickolenko, NASA?s launch director, after liftoff. At times,it looked like Discovery and its seven-astronaut crew would succumb to MotherNature, which had already prevented the launch once with thunderstorms andlightning on Tuesday. A fuel valve glitch thwarted a second launch try. Mike Moses,head of Discovery?s mission management team, said the outlook seemed bleakearlier Friday as he drove to the NASA spaceport under rainy skies thick withclouds before launch. Shuttle managers frequently checked in with NASA?s launchweather officer Kathy Winters every 15 minutes to see how things went, he said. ?I think allthe hot air from all the talking we did blew all the thick clouds away,? Moses jokedafter liftoff. Commandedby veteran spaceflyer Rick Sturckow, Discovery?s astronaut crew plans to fly a13-day resupply flight to the International Space Station. The shuttle iscarrying a new member of the station?s crew, as well as a cargo pod packed withscience gear and a space treadmill named after televisioncomedian Stephen Colbert. Discoveryis due to arrive at the space station late Sunday on the 25th anniversary ofits debut flight in 1984. The shuttle astronauts will join the outpost?ssix-person crew and temporarily boost its population to 13 - the historicalmaximum number of people in space. It will be the second time in as many monthsthat the space station more than doubles its crew size with visiting shuttle astronauts. Threespacewalks are planned for Discovery?s mission, which is NASA?s fourth of up to five missions this year.